All three of these hair masks pretty much offer the same results that I have listed below and all smell great the main difference between them is the ingredients used which I have also listed below. The process is to apply the mask/oils to your dry hair (Except for Hair & Me they say to apply to damp hair) and leave the treatment on your hair for as long as possible to gain the maximum benefits and really let the mask/oils soak into your hair follicles. When your ready to wash out you shampoo 2x and condition once and your hair should look and feel so much better. Hello Hair Island Escape Edition 100g $18.00AUD* - All-natural botanical extracts of lime, grapefruit, vanilla and coconut to fragrance. Pomegranate Seed Oil, Grapeseed Oil, Coconut Oil, Argan Oil, Olive Oil, Olive Leaf Extract and Castor Oil. Hair & Me 90g $16.00AUD - 100% Raw Certified Organic Extra Virgin Cocos Nucifera (Coconut) Oil, Prunus Amygdalua Dulcis (Sweet Almond) Oil, Macadamia integrifolia Oil, Simmondsia chinensis (Jojoba) Oil. Lani 100ml $21.00AUD Roughly - Camellia Oleifera (Camellia) seed oil, Cocos Nucifera (Coconut) oil, Aleurites moluccana (Kukui) nut oil, Macadamia Integrifolia (Macadamia) nut oil. I have medium length hair that is fine, healthy and pretty straight. The results I had noticed with all three hair masks was that they made my hair look very shiny & healthy it was soft and it was also easy to manage/brush once dry. 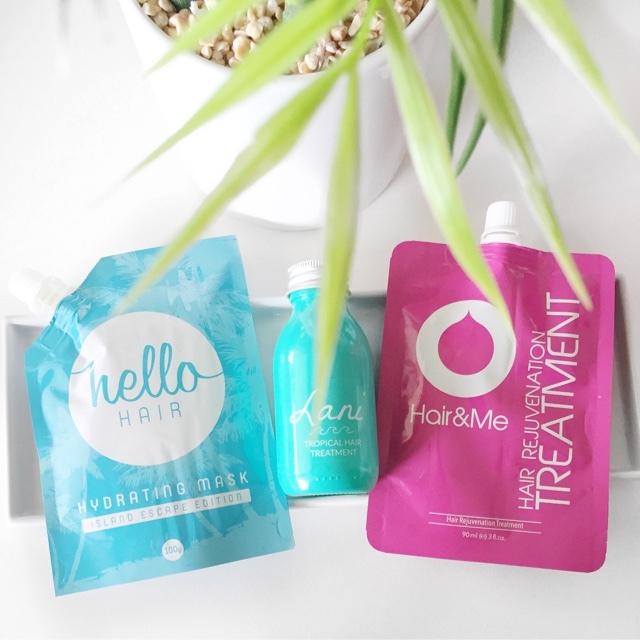 I did prefer the Hair & Me and the Hello hair mask over the Lani just for the fact you can put them in the fridge and get a more solid mask then the oil that goes everywhere. I think if I were to use a hair mask at least once a week for a few weeks I would notice more of a difference in my hair and it would also cut out the need for me to use a leave in conditioner. What are your thoughts on coconut oil hair masks? Beneficial for you? I've never tried a hair mask like this but I know coconut oil in general has all of these amazing benefits. I think I like the sound of the last two masks the best, mainly just because I don't love the idea of castor oil in my hair mask! Thanks for reading Lovely, Coconut oil has some amazing benefits!